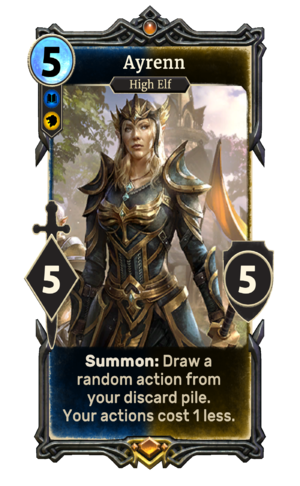 Ayrenn is a unique legendary Mage creature card. It is part of the Core Set. "May the ancestors bless us." "We fight for the glory of lost Aldmeris." "History shall remember this day!" Ayrenn first appeared in ESO. For historical information, see the lore article. This page was last modified on 16 February 2019, at 15:39.